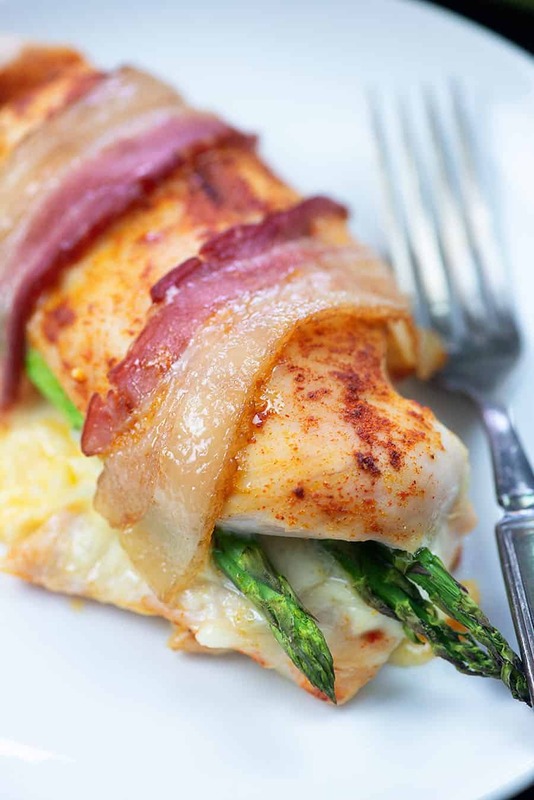 Asparagus stuffed chicken breast is easier than you think! 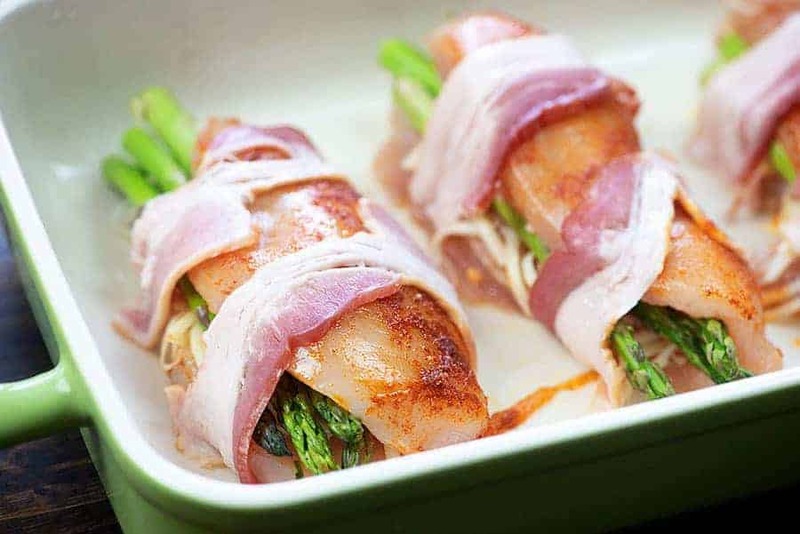 Just season some chicken, stuff it with a little cheese and fresh asparagus, and bake! This healthy dinner is ready in about 45 minutes. I’m just going to be honest with you guys for a second – I’m not the world’s biggest asparagus fan. I mean, fine. I’ll eat it if you put it on my plate, but I’m not going to ask for seconds. It just…it kind of tastes like grass to me. My husband and son, however, LOVE asparagus. So, I make asparagus every now and then to keep them happy and I’m always looking for new ways to use this low carb vegetable that will get me excited too. Boom. Done. Found an exciting way to eat asparagus. Stuffed chicken breasts are my thing lately and chicken stuffed with asparagus and cheese is a total win in my house. I bet it will be in yours too! 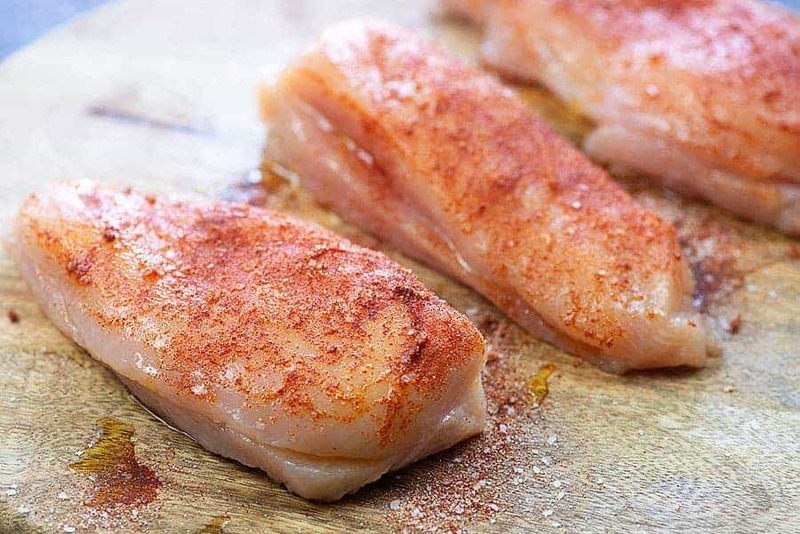 Start with trimmed chicken breasts and cut a deep pocket into each breast. I don’t quite butterfly the chicken, but you’ll come close. To do this, place on hand on top of the chicken to hold it in place and use a knife to slice the chicken nearly in half. Don’t cut all the way through. Watch my video above to see just how I do this! Once your chicken is cut, drizzle it with a little olive or avocado oil and then season it up. I’m using garlic powder, paprika, and salt. Grate some mozzarella cheese (provolone would be good too! 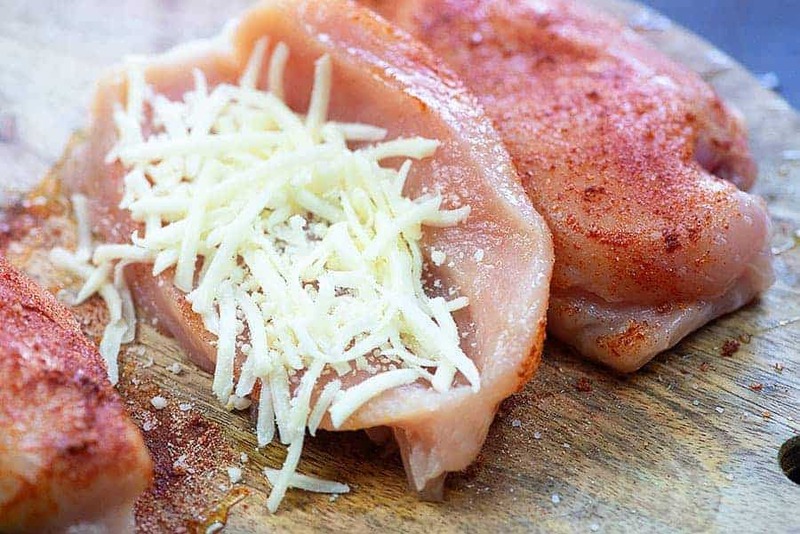 ), open up that chicken breast, and then place a layer of cheese inside the bottom of each chicken breast. 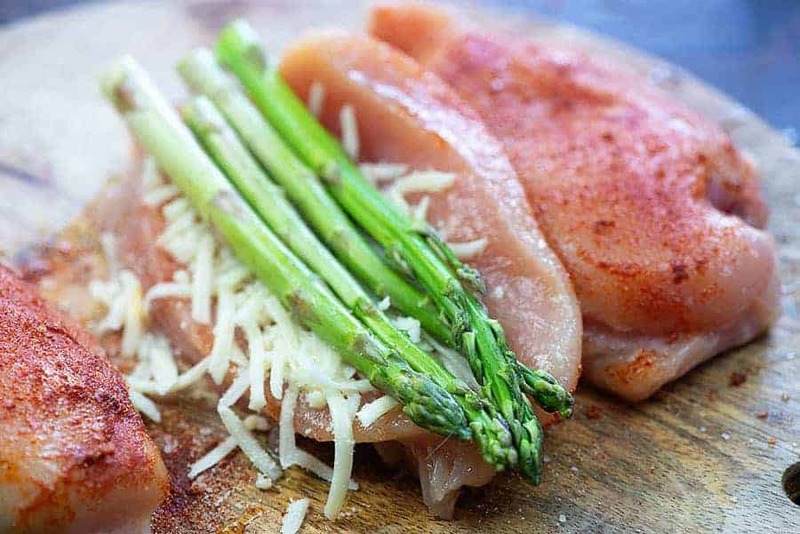 Add 3-4 spears of trimmed asparagus over the cheese and lay the top of the breast back over the asparagus to close it. To help keep the chicken closed during cooking, we’re going to use a couple of pieces of bacon to hold it all together. Just take your bacon and lay it over the top, tucking the edges under the breast. I used one piece of bacon, cut in half, for each chicken breast, but you can certainly use more if you like. This gets baked at 375 degrees for about 35-40 minutes. 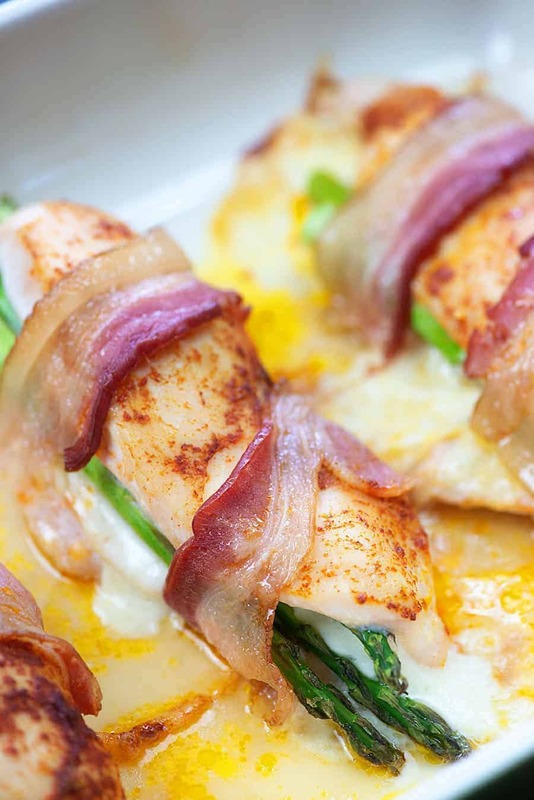 The chicken turns out nice and juicy with a cheesy center full of asparagus. So good! Lasagna Stuffed Chicken: All your favorite Italian flavors right here! Spinach Stuffed Chicken: Literally the most popular recipe on this site and it has great reviews! 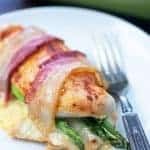 Jalapeno Popper Stuffed Chicken: This one is for the spice lovers! Italian Cauliflower Salad: Make a big batch and eat it all week long. Fried Radishes: Believe it or not, these taste a lot like potatoes! Brussels Sprouts with Bacon: Bacon makes everything better, especially Brussels sprouts! 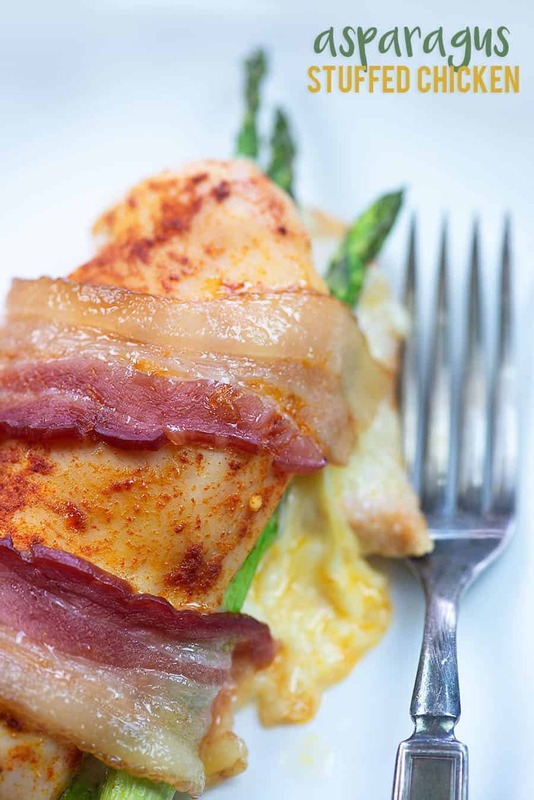 If you give this asparagus stuffed chicken recipe a try, please let me know what you think! For more tasty recipes, follow me on Facebook! 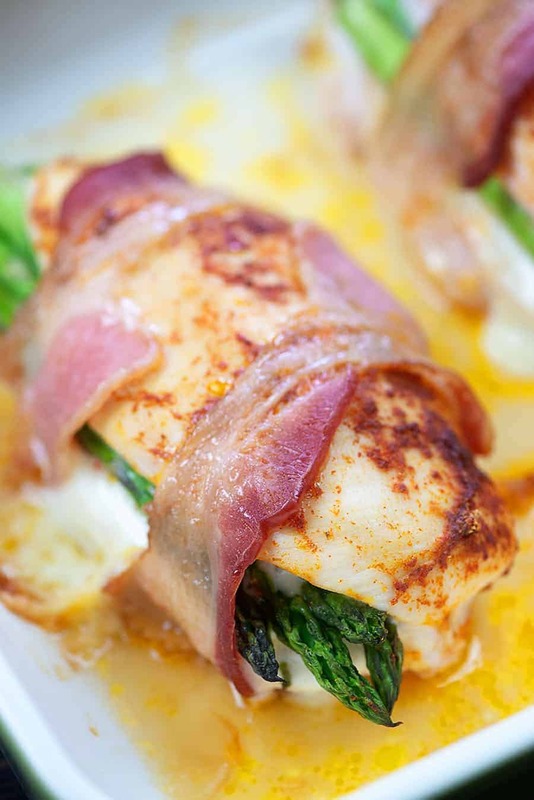 Ready in about 40 minutes, this low carb stuffed chicken is full of cheese and asparagus! Place the chicken on a cutting board and use a sharp knife to butterfly the chicken. Drizzle the outside of the chicken with olive oil. Mix together the garlic powder, paprika, and salt and sprinkle over each chicken breast. Open up the chicken breasts and lay 1/4 cup of mozzarella on the bottom portion of each breast. Top the cheese with 3-4 spears of asparagus, depending on how large each breast is. Bring the top of the chicken up over the asparagus to close. Cut each slice of bacon in half. Lay 2 half pieces over each breast, tucking the ends under the breast. Bake for 35-40 minutes or until a thermometer reads 165 degrees and juices run clear. Can you make it with boneless skinless chicken thighs? As long as they’re large enough to stuff, it should be fine. Can this be done in air fryer? I’ve never tried it, so I can’t say. Made this for dinnner tonight was great. Had to tweek it a tiny bit, the chicken breast I had were 1 large, 1 to small to butterfly so I pounded it out and rolled it turned out awesome. Plus I added a pinch of my own seasoning. I will make this again. Making this weekend!! Looks Yummy! !